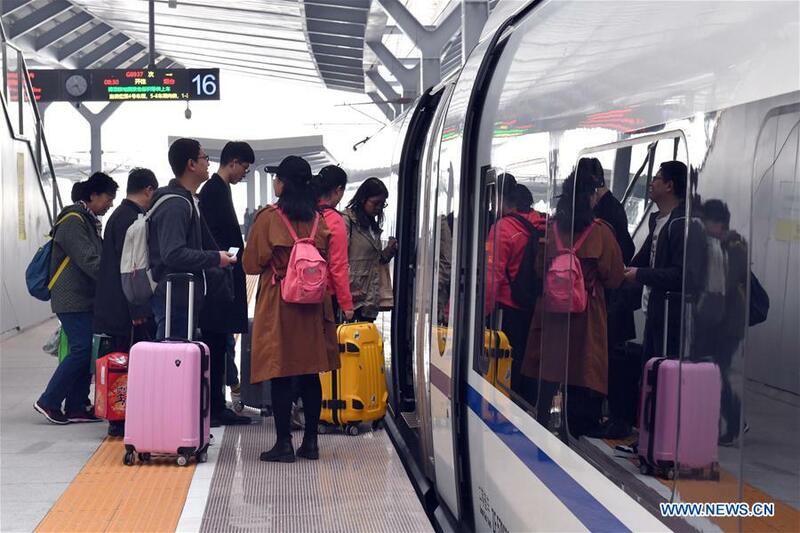 China's railway system will handle around 53 million passenger trips during the four-day Tomb Sweeping Day holiday, according to China Railway, the national operator. The company said on its website on Thursday that it expects to handle more than 13 million passengers daily from Thursday to Sunday, a 7.1 percent increase over last year's holiday. It added additional runs to meet the surge. China Railway's Beijing branch plans to add 170 runs during the four-day period on popular routes, including those linking Beijing with Shanghai and Guangzhou. It estimated that Chinese travelers would make about 4.8 million trips from Thursday to Sunday on lines run by the branch. In Nanjing, the local railway authority has put more trains into service. It said residents in the city would likely make about 340,000 trips by train on Friday. Tomb Sweeping Day, also known as Qingming Festival, fell on Friday this year. It is a traditional Chinese day on which people pay tribute to deceased family members, friends and national heroes. Chinese people have used the day for spring outings since ancient times. In recent years, the number of Chinese travelers, to both domestic and foreign destinations, during the Tomb Sweeping Day holiday has increased annually, and most of them travel by rail for some or all of the journey. For destinations within China, railways offer lower prices and more choices than airlines. At present, China operates more than 131,000 kilometers of tracks. That figure includes more than 29,000 km of high-speed rail, two-thirds of the global total. Last year, China invested more than 338 billion yuan (US$50 billion) in the construction of 26 new railways and opened new lines totaling 4,683 km, most of them high-speed. Nearly 3.4 billion trips were made on Chinese rail lines last year. Every day, an average of 5.5 million people use the nation's high-speed trains, accounting for nearly 60 percent of daily users of the country's rail network. The State-owned rail car manufacturer CRRC Corp, the world's largest train maker, had started developing a new-generation of bullet train that will operate at 400 kilometers per hour. In addition, CRRC is designing two types of maglev trains-a 600 km/h high-speed version and a 200 km/h medium-speed version. Designers said the company expects to put them into service sometime around 2021. China's railway system will handle around 53 million passenger trips during the four-day Tomb Sweeping Day holiday.